After an eight-year-long absence from the most populated country in the world, Google search is going to dramatically make a comeback in China. Since spring last year Google engineers have been secretly working on a project, dubbed "Dragonfly," which currently includes two Android mobile apps named—Maotai and Longfei—one of which will get launched by the end of this year after Chinese officials approve it. The censored version of Google search engine in the form of a mobile app reportedly aims to "blacklist sensitive queries" and filter out all websites (news, human rights, democracy, religion) blocked by the Chinese government, including Wikipedia, BBC News, Instagram, Facebook, and Twitter. "Documents seen by The Intercept, marked 'Google confidential,' say that Google’s Chinese search app will automatically identify and filter websites blocked by the Great Firewall," Intercept's journalist Ryan Gallagher said. 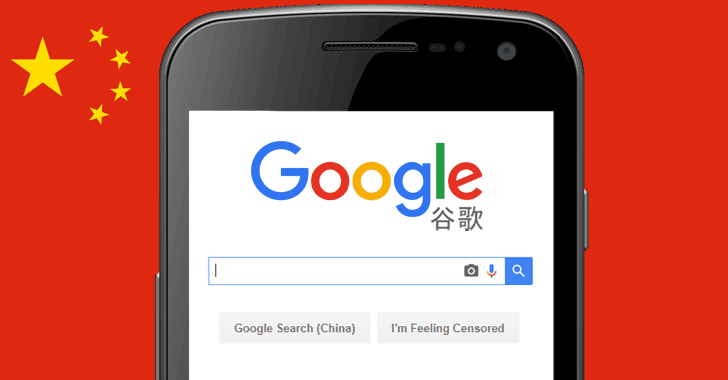 The censorship will also be embedded in Google's image search, spell check, and suggested search features, which eventually means the search engine will not display Chinese users potentially "sensitive" terms or images banned by their government. Some 200 Google employees are working on the Dragonfly project, one of them spoke to the publication because he/she was "against large companies and governments collaborating in the oppression of their people." "The source said that they had moral and ethical concerns about Google’s role in the censorship, which is being planned by a handful of top executives and managers at the company with no public scrutiny," Ryan said. The whistleblower also expressed concern that "what is done in China will become a template for many other nations," as well and it will be "a big disaster for the information age." The news about Google's new move comes less than a month after Apple's Chinese data center partner transferred iCloud data, belonging to 130 million Chinese users, to a cloud storage service managed by a state-owned mobile telecom provider.